I go for a morning run (hopefully on time), then scramble to take a shower and get dressed. If I am lucky, I meal prepped over the weekend and I can quickly grab-and-pack my meals and get out of the house to get to work on time! As I am getting ready, I start up the tea kettle and warm up the water. By the time I am back in the kitchen, the kettle is whistling that hot water tune and my coffee is soon ready! So what is a busy gal to do on Monday and Tuesday?! 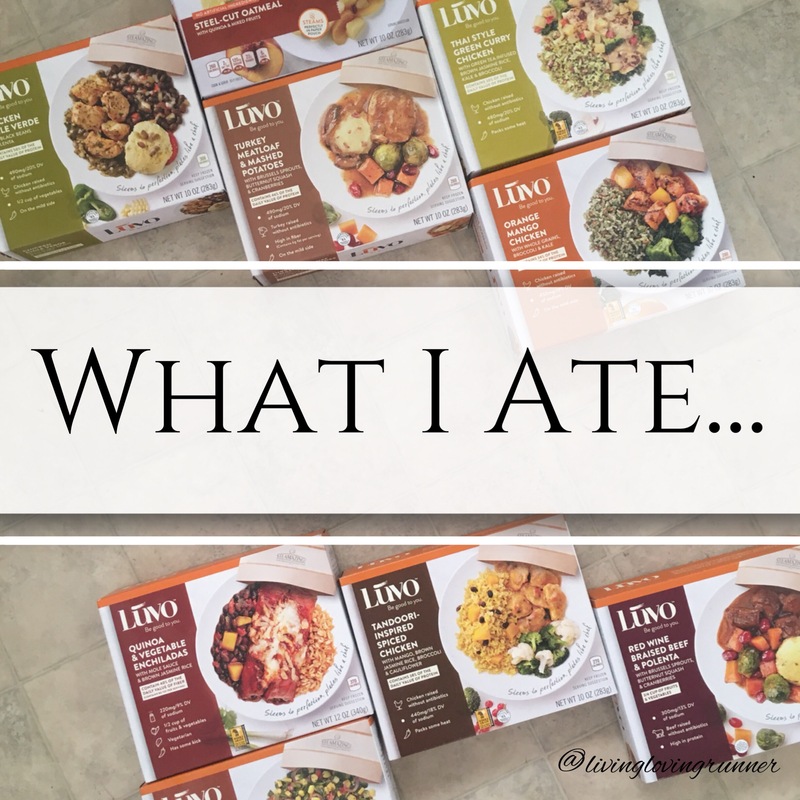 After my busy morning of running around outside and my house, I have been heading to my freezer and grabbing a Luvo meal (or two) to pack up for the day! Most of the Luvo meals are lunch or dinner themed, but there are a couple great breakfast or brunch options! I have quite a sweet tooth in the morning, and this meal hits the spot – hard! The steel-cut oats cook perfectly with a little crunch, the fruit is sweet – complements the hearty oatmeal, and the nuts/seeds and flaky topping rounds out the visual/texture and overall appeal of the dish! The creators of Luvo meals have a simple breakdown of their meals – their 3 • 2 • none Promise. Simply stated, Luvo creates their meals with the right balance of protein + whole grains + vegetables (3), they limit sodium and added sugar (2), and don’t add any artificial stuff (colors, flavors, and sweeteners) (none). With these guidelines, Luvo creates meals that not only taste great, but they can help you keep your nutrition track when you are short on time and/or energy! Luvo not only creates some great go-to dishes (the oatmeal is a staple in my freezer), but they also create interesting flavor profiles that I am not sure I would have tried otherwise. For lunch today, I jumped out of my comfort zone and tried a meal that I was not familiar with! I am not sure what tandoori-inspired means, but I enjoy trying new ways of eating the same old proteins – chicken mostly. While the dish smelled interesting, I was glad that it tasted great! The currants in the rice made it a little sweet, and the “spiced” aspect of the dish wasn’t overpowering. I am a fan! After work, I headed out to pick up little man from daycare and head home for the evening! Since the hubs was going to be out watching the home run derby, I decided it would be easiest to make up a couple Luvo meals for dinner! We both got our pick from the freezer. [dinner] Luvo Kale Ricotta Ravioli for little man + Luvo Chicken in BBQ Sauce for me! I was a little surprised by little man’s pick, but he does like ravioli – so I wasn’t worried about him eating it. I chose a new-to-me dish with the Chicken in BBQ Sauce. In each meal, you can bet that there is a full serving of fruit and vegetables, responsibly raised meats and poultry with no hormones or antibiotics, no artificial colors/sweeteners/flavors, and all that wholesome goodness in less than 500 calories! Now that you know some the facts about Luvo, it’s time to check out their products! I have tried several varieties of their steam in pouches. From their “lighter” breakfast options to their hearty lunch/dinner meals. Recently, they added their Bowls and Plant Based Bowls to their website ordering – and I cannot wait to order some of these varieties (since my local store does not carry them yet). While we have found that the available meals are guaranteed to be in stock, you can at least see if any stores in your area even offer Luvo on their shelves!